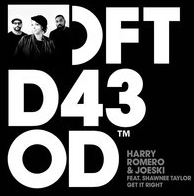 Harry Romero and Joeski have been successful in the house scene since the early-90s, and now with their latest production, ‘Get It Right’, this release looks set to continue that tradition. Between them they have had releases across a wide variety of labels, including their own imprints Bambossa and Maya, as well as Subliminal, Suara and now Defected. ‘Get It Right’ combines soulful and ‘feel good’ house with the darker, deeper sound playing across dancefloors worldwide for a well balanced result. The Club Mix employs the powerful and soulful vocals of Shawnee Taylor, with the bassline lending the track dancefloor weight. The Dub takes the vocals in a different direction; less intense, but with added reverb and a bouncier beat, the track maintains the old school sound. It’s out 10 November on Defected Records, check it out below.